Below the fold, here’s some stuff from the final five months of 2015. Okay, so maybe I wasn’t quite out of low-hanging county high points. The top of Mt. Vaca can be accessed from the top of a narrow, winding, but paved (I had not yet learned not to take pavement for granted) road northwest of Vacaville, then walking on the service road until you get to the top. My notes indicate “the fire clouds were clearly visible to the north”, and it says something about the last few years that I have no recollection of what fire this actually was. This is about where I started picking off the local CC-listed peaks, I think. This is a good training hike behind Los Altos, although the views aren’t great until you get to the top. 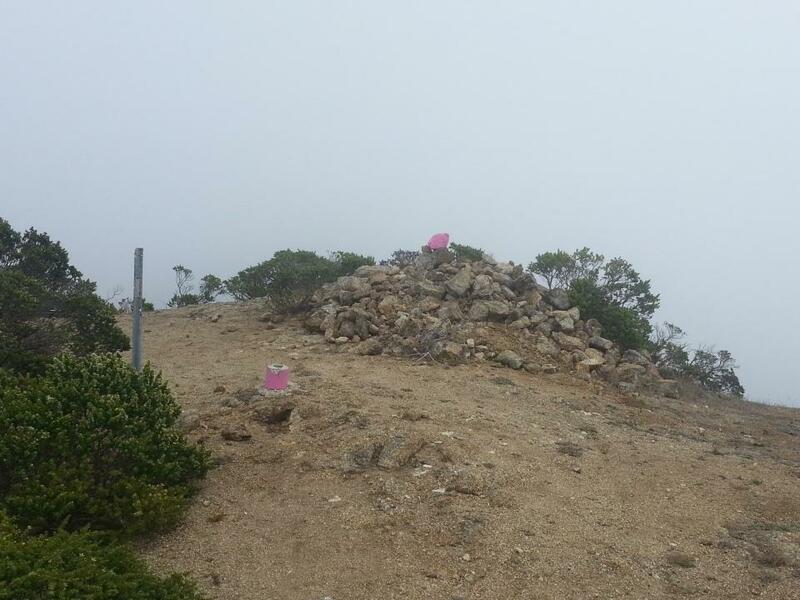 Montara Mountain is another CC-listed peak. Unfortunately this day was too foggy to have much of a view, as the peak is less than two horizontal miles from the ocean. This was the first county high point I did that required a good bit of driving. The trail for Thunder Mountain goes through the Kirkwood ski area in the Sierras. This was a fairly easy hike, with a bunch of rock formations that would have been fun to climb. One oddity is that the “official” Thunder Mountain summit, where the trail terminates and the summit register is found, is two feet lower than the true high point: the rocky summit in the middle of my photograph. A really nice short hike in the Sierra, starting from Highway 108 at Sonora Pass. I felt the elevation a little on this one but it wasn’t anything too annoying. I met an older couple with a friendly dog on top. This is frequently combined with a hike up nearby Stanislaus Peak, but I didn’t have time to do that and still get home at a reasonable hour. Something to do in the future. Snow Mountain is an example of a “two-fer” county high point: the county line between Lake and Colusa goes directly over the summit. However it is not a “true two-fer”: there are separate rocks on each side of the county line that are the highest point in each county. I’d also kind of like to come back at some point for the west subpeak. My timing goal for this hike was to get back to paved road before sunset, and in this I was successful. Unfortunately, while Google Maps had cleverly navigated me to Stonyford using only paved roads, I no longer had cellphone reception and couldn’t use those directions to get out of the area. I ended up relying on my guidebook’s directions which involved a good deal of gravel road driving, now lit only by my headlights and the moon. I had driven to Boise to referee a quidditch tournament held the day before. Instead of driving straight home, my plan was to tag a couple local county high points first. Boise Ridge is accessible from Boise via 8th Street. As one drives higher on 8th Street, the pavement ends and the road becomes steadily rougher. I was able to coax my Forester fairly high on this road, but eventually had to give up when the ruts proved too much to handle. After backing down carefully to the nearest pullout and parking, I hiked up the rest of 8th Street, turned right, and eventually found the stake marking the highest point of the ridge in the county. I was rewarded with a nice view of Boise. After returning to my car and driving back down, I headed to Pickles Butte. This didn’t require any interesting driving, but it’s a rather ugly high point as it’s next to a landfill. I got a couple pictures, headed back to the car, and drove home, being careful to take the Oregon stretch of U.S. 95 at a speed that would not incur the wrath of the Oregon Highway Patrol. This is mostly a driving adventure, but an interesting one. San Benito Mountain is located in the Clear Creek Management Area, which is a special-access BLM area due to naturally-occurring serpentine asbestos near the old mercury mining town of New Idria. As a result, you need to buy a permit from the BLM website and call the local BLM office for a gate combination to get into the area. With good reason, they don’t want you camping here. 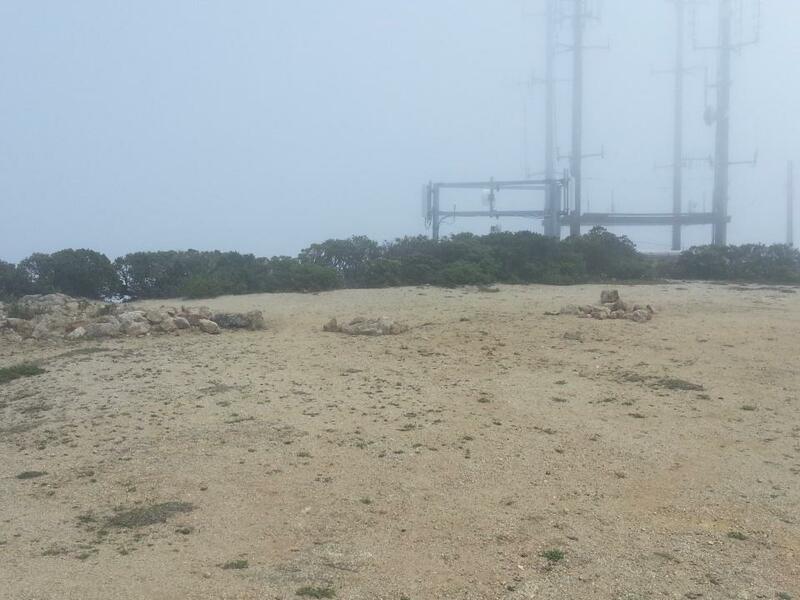 I got my permit, got the gate combination, and drove through the dirt roads to the last intersection below the summit. I probably could have made it all the way, but I didn’t want to risk anything happening to my car out here and I also wanted to get out and hike a bit. The hike and the drive back were happily uneventful. Mt. Bielawski is famously on a Christmas tree farm, and so traditionally it is accessed during the three weekends a year that they are open and selling trees. Unfortunately, when I drove up to the entrance of the McPherson Christmas Tree Farm I was instead greeted by a sign stating that the farm had been sold effective 30 December and would not be opening this year. Not trusting the new ownership to be friendly to highpointers, I came back the next day, located an entrance that featured an open gate and lack of signs forbidding trespassing, and quickly tagged the highest ground. The summit of Cobb Mountain is owned by the Calpine Corporation. Historically they’ve turned a blind eye to hikers wandering through their land, but I decided to go on Christmas Day to minimize any risk of discovery. One thing I didn’t count on was snow. The snow was not particularly hazardous or anything, nor deep enough to make postholing a problem, but it started from about 3200′, shortly above the gate that marks the end of the public road. I had only dressed for “maybe there will be a little snow near the summit”, so I ended up being quite chilly. The entire Cobb Mountain area had been burned in the Valley Fire, although happily the homes in Whispering Pines by the gate had not. There was occasional fire-induced deadfall blocking the trail, although it was easy enough to clamber around. It also killed most of the manzanita on the southwest side of the mountain, making any bushwacking minimal. The exact high point of Sonoma County was difficult to discern. It’s a “liner” on a subpeak and any identifying cairns or registers placed by previous highpointers had been wiped away by the fire. I traipsed around the flat area near the GPS-indicated county line until I felt sufficiently confident that I had tagged the highest point in Sonoma County at some point.